Art from Storm #25 (Published by Don Lawrence Collection), pencils by Romano Molenaar, colours by Jorg de Vos. Yes, that’s something that sometimes seems to be missing in the Netherlands. One artist has a lot of plans, but is not there yet qualitatively, while there are also people who really do top work and who go: “Gee, I can draw, now what do I do?” And I’m always trying to see with the projects I have on standby and in the Art Kings studio, what else can I do with them and what would be interesting now. That’s part of the business side of the trade. Finding a comic to draw is great fun, but what can I do with the name that I have built during the last fifteen years? How do I improve my chances of getting my foot in the door at video game companies? If I tell them I’m currently working for DC that opens a few doors. That’s why I regularly keep myself busy with the business side of things. Talking about the business side of things, does DC allow you royalty rights? Yes, I think with DC, when you sell 75.000 units, you get royalties. Only Birds of Prey sells about 17.000 a month, so we’ve still got a long way to go… However, I did receive an amount of royalties from the digital sales of Birds of Prey. That arrived rather unexpectedly, but it was a nice surprise of course. It wasn’t a staggering amount of money. But it does work, DC is very well aware of the sales numbers and it’s further incentive to the creators. Is my assumption correct that the addition of royalty rights into freelancer contracts reflects an improvement in the way creator rights are handled by the ‘big two’ compared to the nineties? Even for my Marvel work [in the nineties] I once received a royalty. For my Top Cow work I didn’t because they weren’t big sellers. But they had a similar type of construction. I believe that nowadays every contract has some kind of construction that when you sell above a certain threshold you receive royalties. So, were you in a position to negotiate hard about your contract with DC? Of course you’ll make a price agreement for the page rate. And you agree or you don’t. In my case, I was like: I have a studio here, I’ve got Storm, so I won’t let this opportunity pass. As an artist, you can choose not to go for the top rate -I can tell you, the top rate ain’t bad- but instead do it to build your name. That way you’re investing in your résumé, and the money will come later, when you can sell yourself at a better price. When we began talking Romano told me he works from nine in the morning till twelve at night. Only interspersed by driving the kids to and from school and dinner. I asked him how his work schedule influences his family life? It means it’s pretty hectic and there are some things I just don’t do very often. I don’t watch movies, I don’t watch TV -or I watch the news at half past one in the morning. Now that I work from home I see more of my children than ever before, and my wife of course. So that in itself became a win-win situation. The hard part of this is that I am home but not readily available. With children that’s sometimes difficult: When they want you to play or when they ask you to come play football outside… Then it all depends on my workload and schedule, whether or not I’m able to play with them. Sometimes, it’s not possible. On the other hand: if I’d just go to work in the morning, I would definitely not be able to. That’s tricky sometimes, when they do see their father but he cannot come along. I have identical twins, 10 years of age. They are now at an age that they are very curious and want to learn a lot. Of course I’ll answer them, but then I go: “Sorry, I have to continue working.” Being kids, they don’t always understand. But I have a spacious studio, so they occasionally come and play with me or make some music –I’ve also got some instruments in my studio- and sometimes they draw or colour along with me. That’s always a good time. So, that’s nice enough, no complaints there. Only other things… [exhales] ….like, parties… …If I really want to go to a party, I must really plan ahead in my schedule to decide if I can make it. It sounds harsh, but then the party really has to be worth it, to make the time. That’s sometimes difficult for people to understand: I’m constantly under a whole lot of pressure, because of my work. What’s your general outlook? Is the time you’re currently putting in a temporary situation? Thanks so much again to MR Molenaar for taking time out of his schedule to talk to me. If you missed part one, part two, or three you can always listen to the whole interview (in Dutch) through the Open Your Geek Mouth podcast, or find a paper version in the Dutch comic magazine Strips2Go. That’s it for now… I’m already busy with my next interrogation victim Boykoesh, of Captain Ultimate fame! 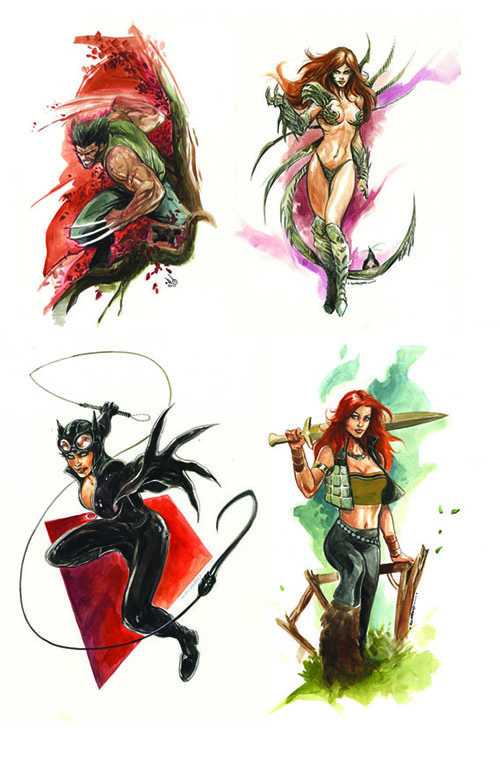 A couple of commissions by Romano Molenaar. That’s all very traditional, do you do any digital work? For comics, not really… I do a lot of pencil work, even for Storm. For the studio I do a lot of work digital. Now, I’ve also started to try out digital inking a little, but I’m old school and prefer working on paper. But yes, you have to stay up to date. And especially with our studio we work digital and I keep informed about that. I just don’t use it for the comics and Storm. Okay, do you use any specific software, like Mangastudio, or is it more general stuff like Photoshop and Indesign? I have checked them out, and gave them all a try. I’ve been working with Photoshop for about eight years, and that in itself is working very well. Occasionally you receive something new, like today I got Mischief, a vector-based drawing program, that’s quite interesting. It allows you to blow up your paintings on a really big scale. That’s something I’m going to take a look at, perhaps it’s interesting for the future. But now, it’s mainly Photoshop. 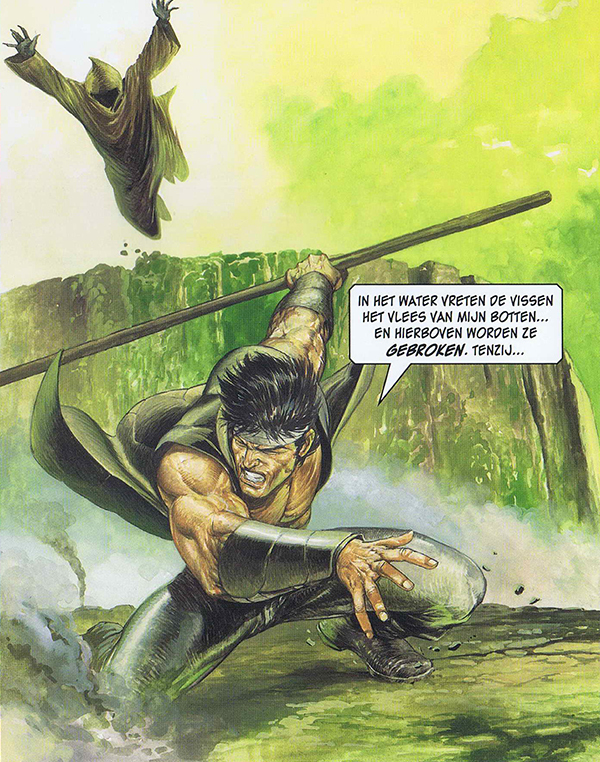 Here’s a look into Romano’s proces, from a cover he did together with colourist Jorg de Jong, for a Conan translation by Dutch publisher Dark Dragon Books (animation courtesy of http://www.stripspeciaalzaak.be). Has the use of Skype and modern communication technologies changed the international aspect of your work at all? Not really, I’ve actually worked like this forever. Fifteen years ago, when the internet was just coming up, I believe around 1995/96, I already had the idea of: “Hey, if you have internet you can communicate with each other much easier.” And that was just around the time an American Studio named Lion Comics came to the Netherlands -to Breda- henceforth things went very fast. What’s your favourite character to draw? I’m a big fan of The Darkness and I have had the honour to have drawn Wolverine in the X-men. Unfortunately, he did not have such a big role, but that’s a character that I’d want to tackle once more. I’m not explicitly looking for work at Marvel, if that was the case I’d already have knocked on their door. But I would absolutely love to work for Marvel again. I’m not really tied to DC. Again, if DC or Marvel would not be interested, I would like to work for other studios. But there are still a number of characters that I would like to draw: Iron Man, Superman, Green Lantern… You know, all these characters are interesting to work on. Do you have any particular objects you enjoy drawing? I’m more in favour of the male anatomy, especially the muscle groups. But it actually turns out that my women are often eye catching. I think that women are artistically my weak point. That’s funny because the studios do not always find that, that’s how I got put on Birds of Prey. Because my women were described as very strong, yet still feminine. It’s just like [Storm creator] Don Laurence, who thought he didn’t draw women well. While actually he his women were exquisite. Interestingly enough, that’s a similarity between us. I think my women are not as good as my male forms. Anyway, perhaps that will change. I’ll always have something to improve on. The female form actually is more difficult to draw than the male form and so I’m always playing around with that. Okay, but do you enjoy drawing a certain object specifically? I am always in favour of cars. I actually wanted to be car designer. So I’m always a big advocate of including cars or motorcycles in the script. In Birds of Prey I get to draw Batgirl riding her motorcycle a lot, so that helps. I’m not very much into drawing buildings, but that’s something that has to grow I think. I’m trying to get my buildings on the same level of my men and women. And Gotham City is of course super interesting to give a twist of your own! You are not schooled in art. How did you teach yourself? Purely by looking, seeing. Watching others. Take criticism, take it in and do something with it. It is not easy, you have to do it yourself. Nobody will draw for you. You should be open to improvement, you must be open to set a standard for yourself. Ask yourself: “Why are THESE artists where are they now?” Be critical of yourself. Just as I am critical of my women: These aren’t what they should be yet, that’s just an area where I can improve. And there are more things like that. You’ve got to make sure you keep an honest look at your own work. That’s hard because sometimes it becomes a grey area: When everyone says you’re good, you’ll be inclined to stop learning, which is obviously a dangerous pitfall. You have to remain clearheaded and keep looking at other artists to see where you can refine your own art. The urge to keep learning is imperative. Aaaaaaaaaaaaaaaand here’s part two of my Romano Molenaar extravaganza. If you missed any of the earlier stuff, here’s part one and here’s the podcast of our talk. Can you give an idea of collaborations that worked really well? Yes, exactly! Phil’s a very good writer, who can also draw particularly well, which is always an advantage. I must also say, that I… …Did I mention I’m not very good with names? [Both laugh] When you work at Top Cow, you often find out who inks your work, after the fact. And they’ve got inkers like Joe Weems who are really great. There are other names as well, but that’s a tricky subject for me as you can tell… Also, I must say that the team I’m working with now, Jonathan Glapeon and Chris Sotomayer, is a dream team. In fact, I used to do more freelance assignments, each six to seven issues and then on to the next thing… But now that I’ve had a year working for DC, those names stick in my head because I’m working with them for longer periods of time. I think that when you work together for so long, you’re going to appreciate their work better and your own work improves because of how great they are. As such, these guys are currently the names that pop up in my head when you ask about great collaborators. That makes it difficult for me to think of other less recent names. Are there any names in the industry that you would like to work with in the future? I’d really like to do something with Marc Silvestri and Jim Lee of course. If Jim Lee would like to draw layouts for a new Superman book for me to fill, I would not mind that at all… [laughs] Also, here’s the interesting thing: I’m now entering an area, where my contacts aren’t exclusively horizontal anymore, I may just end up working with someone higher up the chain in the comic industry! Though, overall I don’t tend to look over my shoulder too much, I’m much more interested in the future. Which is why I have to say: I’d like to work with anyone who knows what they’re doing and who can simply excite me with their story. I know, I know, that’s a very politically correct answer…. To me, the names are a little less important. But if you succeed in affecting me with you script, inks, or colours then I’d definitely like to work with you –whether it’s at Marvel, or Dark Horse, or wherever. Did you ever receive any pro-feedback of big industry names that has been of particular value to you? The other day I got some from Jim Lee! Jonathan [Glapion] had sent the cover ​​for issue 22 of Birds of Prey to Jim. Later Jonathan showed me Jim’s reply, along the lines of: “Very nice, it looks super good.” At that point you’re like: “Okay. We’re definitely getting closer to the fire.” You also see that a guy like Jim Lee is only human. Jim has obviously done a lot for the industry and achieved a lot. As an artist, that’s the guy you want to get feedback from, so you know you’re on the right track. And that’s something you have to do yourself, you need to strive to get the idea out of your head and onto the page as good as possible. But when a celebrity like Jim Lee says that, or Marc Silvestri ‘likes’ your art on Facebook, you think: “Okay, apparently I’m considered a good artist.” And it’s the same with big names like David Finch, sitting next to you at a convention, or Barry Kitson. When they see you drawing a Lara Croft commission and say: “Wow, that looks very good,” to hear it from their mouths is invaluable. Those are very nice experiences. Have you done any design work for DC characters? Yes, I designed a character named Condor for Birds of Prey. You get a description from the writer saying: “There will be a new character, that’s like this and this… …he only needs to be designed.” After that they basically tell you to go for it… Also, the cover of issue 22 shows a new team of villains I designed too. That is insanely cool to do. You get basic information, like one of them is a guy with electric powers, the other one is a big guy. Then you have to figure out how to visually fit these characters in the fictional world and make sure you’re actually designing something new… You have to give them your own twist. And that goes back to the experiences of my younger years, designing my own superheroes as a kid. You actually take some of that with you when you’re designing new characters. Like, when I was about twelve, I drew this guy… You know what; why not give this new character HIS coat? So sometimes you take a ride in the wayback machine, only this time it’s for real. That realisation is super cool. The suit was open, so to speak. I wasn’t told to do this or that. But he’s called Condor, so it should somehow have a bird motif. Designing the suit basically took a single sketch. The helmet however… I had given him a helmet that looked too much like Hawkman. Then Jim Lee made ​​a quick sketch of a Roman helmet, one of those things with an eye slit in it. After that, I finalized it in one or two sketches. I also created a number of colour variations in Photoshop and they chose the red, white and grey version. Does he have a purple helmet? I think he has a red helmet. I often only see my pages back in black and white though. Let’s see… Yes, officially he should be red… It may be that the colourist put a layer of lighting on it, making it purplish… It’s supposed to be a little bit like burgundy. That’s right, I didn’t get to talk to him. But apparently he went around the office with the designs and received a lot of positive reactions… There was just the thing with the helmet, which makes you think: “Okay, that’s very cool. My design is going to my hero, my role model.” I’m actually creating characters that are for ever part of the DC legacy. That makes me think I’m doing something right. U Decide: Condor’s helmet: Purple or Burgundy? Art by Romano Molenaar, from Birds of Prey #13 (DC comics). Would you consider working for the Big Two to be your ultimate career goal in comics? I’ve always been a big fan of Marc Silvestri and Image comics, so that’s where I initially leaned more to. But I’ve never thought: “Now it’s time for me to work for Marvel or DC.” I did say it’d be cool to work for them some time. But I think more along the line of: If it’s a cool character, or a cool story I don’t really care for which company I work. 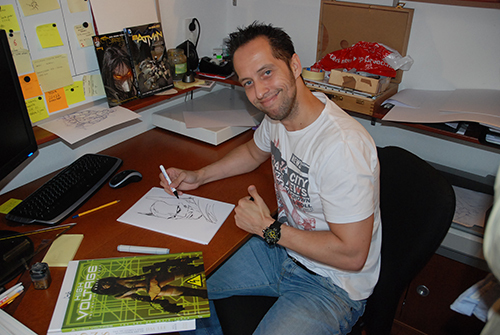 And now that I’m working for DC, I notice that –for me- there is no difference compared to working for Top Cow or Chaos Comics. To me, it’s all the same… Of course, with DC and Batman you have a slightly larger audience, which admittedly is an advantage. But if I stopped working for DC and started working for a smaller studio, I would do it with the same passion. I have to admit though: Working for DC doesn’t hurt your résumé. And how does this relate to your European comic work? You know, Storm is also something we have inherited from Don Lawrence. That will never be mine or Jorg’s. So I relate to Storm in the same way as my DC work. Fortunately, the fans are responding very well. We’re positively accepted as the new team at Storm. But it will never be our own thing. That’s the same with Birds of Prey. With Condor for example, it feels like that is actually my character, but it is –and always will be- the publishers’. So I can never say that Storm is closer to me than the comics, because in principle they exist at the same distance from me. Yes, there are some projects in there that are our own initiative. When we design our own videogame characters we’re credited as the designers. That’s a big difference. The copyrights of those characters are also ours. Look, I will never get any rights on Condor. I can only say that I’m responsible for his visual design. And that’s okay, it’s good to know that I’ve contributed with my design. That’s more for myself, I won’t say: “Look, that is my character!” To me it’s just a milestone, and I take pride in it. So, am I correct in assuming you have some creator owned ambitions in the comic field then? Yes, I have. But because of my workload over the last 10-15 years, I haven’t had time to do a lot with that. But there are certainly a dozen ideas on the computer that I occasionally pick up again. These projects advance slowly, gradually, step by step… And if there’s ever time or an opportunity, these projects will certainly proceed. It’s just that my workload right now… …If I’d currently continue work on these projects I’d get in some serious deadline trouble. Because making your own production -creating and publishing it- that takes a lot of time and energy. But I’m always working with people, just throwing out lines. That’s also a precautionary strategy, for if DC calls it quits. I want to have some things standing by. In that respect, I’m always thinking ahead. I’m not really very conscious of my style, of course I grew up in the Image era… So there’s a lot of THAT in my style, but I try to add to this with my own sensibilities. Shading, cross hatching, that kind of stuff. 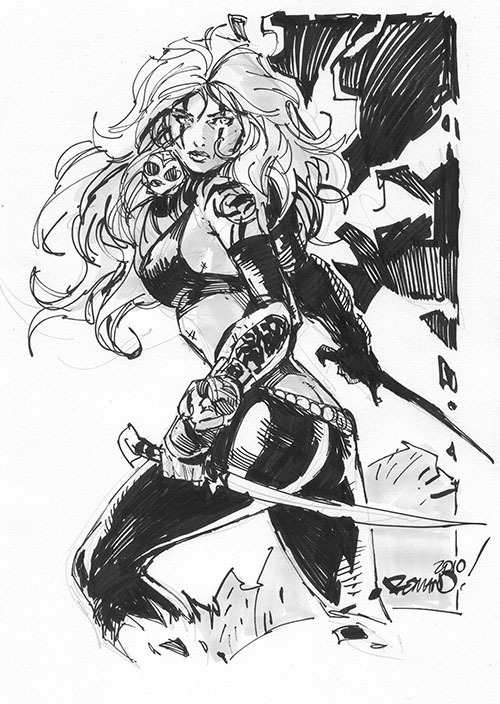 At the base of my work is the art of Marc Silvestri. I’m a big fan of his work, there are definitely more than a couple of layers of him in my art. Then there’s also guys like Todd McFarlane, anyone can tell that I’m affected by his stuff. But as you progress, you’ll go and add things of yourself, leaving other stuff, defining camera angles… In doing so, you create a certain style of your own that is going to be recognized by the fans. Looking back at the launch of the new 52 and the house style that harkens back to the nineties, you seem like a natural fit. Could you have guessed that this new editorial course from DC would lead to a steady stream of work for you? I must admit that up to the point that I got in touch with Tony Daniel [writer of Molenaar’s first published DC work Detective Comics annual 2012], I didn’t read any comics anymore. I was actually more involved in game development. At that time I was just coming back at Top Cow, where I’ve done issues 95 to 100 of The Darkness. Top Cow’s is also my style, you know: The dynamic, flashy, sharp look. That really appeals to me with them. At that time, I had the intention of quietly trying to set myself up in the comic world again. That went a little further than I expected… And indeed looking at the New 52, that 90s era Image style was really what DC was looking for. Looking at the different titles you have worked on in the past, it seems your visual style seems to change slightly on a project-to-project basis. How much of this is the result of working with different inkers and how much of this is you deliberately changing things up? If I work for Top Cow, or for another studio, I look at the work of the studio and then I –apparently- take something of that style with me in my own work. And I often hear people go: “Hey, your work at Top Cow is much sharper!” Perhaps this is because Top Cow has those inkers, whose line work is very sharp. If you know that, you’re going to accentuate such a style in your pencils. My DC-work, in comparison, has much more of a narrative-driven focus. Also, the current house style of DC uses slightly quieter, rounder lines, with more shadows, more mass in the characters and backgrounds… Knowing myself, I probably picked up something from that. And I think that’s what people notice sometimes. But I don’t go like “let’s throw some DC into my art today”, or something… It goes quite unnoticed. Can you elaborate on your different experiences with inkers? Yeah, inkers are an important part of the team, as are colourists. They say the artist is the number one name on the book -although that is actually the author. Comics are foremost a graphic story, and I think that without a good inker and colourist –I’ve been there- the graphic part can go horribly wrong. In principle you work in a team of three and occasionally you have to hope that you are paired with people that you have a good click with, both artistically and personally. When you are tuned-in to each other, you can reinforce each other and learn to read each other’s work. When that happens, it strengthens the whole visual side of a book. This really raises the appreciation for your collaborators. That’s the point we have now reached with the creative team of Birds of Prey. We [Molenaar, inker Jonathan Glapion & colourist Chris Sotomayor] form a cluster of three with which we hope to raise the bar for Birds of Prey. I hope fans too will take notion of this, so we can get this title up and running again. Yeah, reading the last couple of issues of Birds of Prey, I got the idea that this was a creative team that was perfectly in sync. Yes, we’ve hit the point where we’re in the flow of delivering the next book, and then the next book, and happily continuing that cycle. Is the collaboration for DC comics at all different from that on your Dutch title Storm? Seeing as the two products look very different, is it true to assume there’s a big difference in production time? Do you take more time to produce pages for Storm? Per page I take a bit longer, working on a typical page of Storm. That has to do with the fact that filling out a Euro-comic page works differently than filling a US comic page. In American comics you can play around with silhouettes and large blackened shadow areas, which is not possible on a Storm page. Because all of the backgrounds are fully painted, I also have to render them completely in pencils. So, there’s something of a difference. 41:00 Paars of Bordeaux rood, wie is er kleuren blind? Gerard, Romano of de inkleurder?!?! 43:09 Werken voor the Big Two, het summum? 44:36 Ligt Storm dichter bij je? 48:16: Verdient het Amerikaanse werk ook beter? 51:07: Ontvang je ook royalties op basis van de verkoop van Birds of Prey? 53:14: Hard onderhandeld over het contract met DC? 55:15: Hoe ziet jouw werkproces eruit? 57:44: Werk je ook op digitale media? 60:00: Herken je de ontevredenheid van Paul Jenkins naar DC editorial toe? 62:02: Welk personage teken je het allerliefst? 1:08:54: Wat teken je liever niet? 1:10:31: Hoe heb je het jezelf allemaal eigen gemaakt? 1:12:22: En hoe heb je jezelf de sequential story telling eigen gemaakt? 1:14:24: Effect van jouw werkdruk op je gezinsleven? 1:18:47: Zijn er ook schrijfambities? 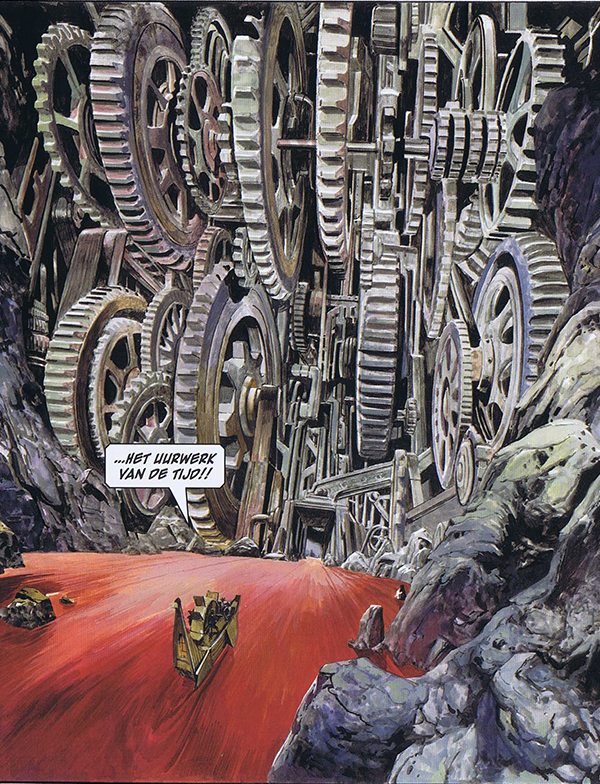 1:19:58: Wat doe je nog naast de comics?